This was my first trip to Japan and I had a great time. 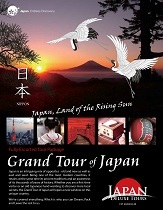 Using Japan Deluxe Tours was the right choice. The Japan tour package had everything we wanted. The hotels were beautiful and the meals were delectable. Thank you to our tour guide Tanaka san for teaching us so much about every place we went to. So impressed at how knowledgeable she is. Going from Tokyo to Takayama and all in between, I loved the experience. I felt all excellent except Fukuoka. Sushi lunch and dinner at Onsen were very good. Our tour guide, Ms. Tanaka, was an excellent guide - efficient, kind and a great sense of humor. Long rides, but very enjoyable.